We offer a full range of dental services and treatments to help you care for and maintain the health of your teeth – and find your most confident smile. Pain in one or both of your jaw joints? Earaches? Pain when you chew? Stiffness and pain in your face and neck? If you suffer from TMJ, you already know how painful it can be when your temporomandibular joint gets out of line. Many people suffer from TMJ. The most common cause is when the cartilage slips out of place in the joint. Other causes include injuries or dislocations of the jaw, teeth misalignment, arthritis, and, the big one, grinding your teeth. Luckily, a simple treatment called an occlusal splint can really help. An occlusal splint is a bit like a mouth guard. It’s a smooth plastic form the fits over your teeth to enable your jaw to close on an even surface. Once the jaw is aligned in the correct position, you might start to feel relief from the pain within a couple of hours- certainly within a few days. Generally, we recommend people wear their occlusal splint at nighttime, to reduce wear and tear on the teeth when clenching or grinding can be at its most problematic. During your appointment, we’ll look carefully at your jaw to see if there are signs of irritation or inflammation, and to see how it moves in any direction. We’ll talk about your symptoms, and possibly use some kind of imaging – a scan or an x-ray to confirm the diagnosis of TMJ. Next, we’ll create the dental that’s right for you, taking an impression of your teeth, so that we can mold the perfect fit. Occlusal splints generally need to be adjusted a few weeks after your first visit, because your jaw joints will start to relax back into position, shifting the shape of your bite. Dentures are removable false teeth which fit over your existing teeth and gums, giving you a full set of teeth and eliminating any potential problems caused by gaps. We are able to help you with a partial or a full set of dentures, so that you can prevent problems with eating and speech, as well as giving you confidence in your smile. During a visit for dentures, we’ll examine your teeth, and remove any that need to be extracted. Next we take an impression of your bite, so that we can make a set of dentures precisely to fit your mouth – don’t worry though, we’ll give you a trial denture to wear while your real ones are being made. 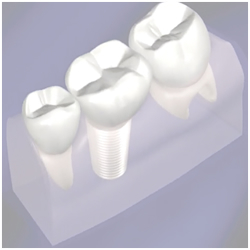 A dental implant is a titanium screw that is integrated into the bone, and acts as an artificial root for a false tooth. Because titanium is a biocompatible metal, over time it becomes a true part of your body. If you have missing teeth, or a missing tooth, this can be a great way to restore your bite – and your smile – for many years. We usually do dental implants under local anesthetic, though we can give you a sedative if you are feeling nervous, to make you more comfortable. Once the titanium root is secure, it will take around a month for your bone to fuse to it. During that time, we use a temporary cap to keep your smile intact. 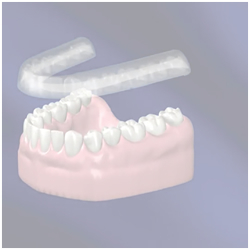 We’ll also take impressions of your teeth which are used to craft the final implant. You should make an appointment with a hygienist to ensure that your gum around the implant is kept healthy. 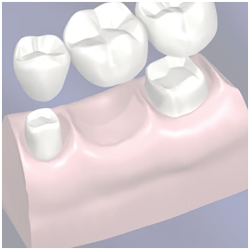 Finally, your new tooth will be bonded to the dental implant, and the procedure is complete. 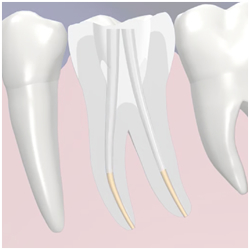 Root canal (endontic) treatment is necessary if the pulp and tissue inside the root canal of your tooth becomes infected with bacteria. You may feel extreme sensitivity to heat and cold, as well as swelling and tenderness of the gum. The goal of treatment is to return the tooth to health – our chances of being able to do that are much better if you come in early, so don’t be afraid, let’s tackle this together. First of all, we can reassure you, you won’t feel any pain. We use a gel to numb your mouth and an anesthetic injection. We use a rubber sheet over the tooth to prevent it being contaminated with saliva, then we gently identify the root canals, and flush them with disinfectant solution. 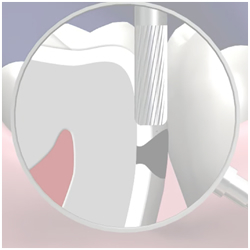 Once the root canal is clean, we use a filling to seal the canal so that it cannot get re-infected. Finally, we seal the tooth with a temporary filling. A week or two later, we can fit you with a crown or a permanent filling to protect and strengthen your tooth. If you have missing or broken teeth, or teeth that cannot be protected by a filling, our full crowns and bridges can help protect your teeth and restore your smile. A crown is a tooth-shaped cap that covers for a tooth that is weakened, cracked or broken. Our dental crowns are custom-made for you, so that they match your teeth. Dental crowns and bridges can improve the appearance and strength of your teeth and ensure that you’re smiling your best smile for many years to come. During treatment, the area around your tooth will be numbed with jelly, then with anesthetic so you won’t feel anything. Next, we shape and prepare your tooth, so that it’s ready for a crown, and take an impression to make a crown that’s perfect for you. We fit you with a temporary crown, while it’s being made. Once the crown is ready, we use dental cement to bond it to your tooth, and your smile is complete. A bridge is an artificial tooth connected to a set of crowns. 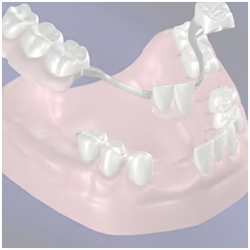 We use tooth bridges to fill in the gap created by one or more missing teeth. During treatment, the area around your tooth will be number with jelly, then with anesthetic so you won’t feel anything. Next, we prepare your teeth for the bridge, and take an impression so that we can make a bridge that’s a perfect fit for you. We’ll fit you with a temporary bridge while yours is being made, so your smile will always be intact. Once the bridge is ready, we bond it to your teeth, and adjust it carefully so that your bite is comfortable and natural-feeling. If you have a cavity – a hole in your tooth – you’ll want to have it cleaned and filled to prevent further decay. Often people are worried that a cavity filling might be painful, but with careful treatment and attention to detail, we’ll make sure that you’re comfortable and pain-free. There are a number of different fillings that you might consider. The most common ones are amalgam, which is a silver-colored metal filling, tooth-colored filling (white filling), composite and glass ionomer fillings, gold inlays and onlays, and porcelain inlays. We can talk together about which kind of filling is right for you. During treatment for a tooth filling, we’ll numb the area around your tooth with a jelly, then use an anesthetic so you don’t feel any pain. Next we’ll clean out the decay, and fill the cavity so that your tooth is smooth and whole again. Treatment for a tooth filling usually takes X hours.